Fox Legal Analyst: If Trump Did Try To Meddle In Cohen Probe, That Is "Clearly An Attempt To Obstruct Justice" - Joe.My.God. 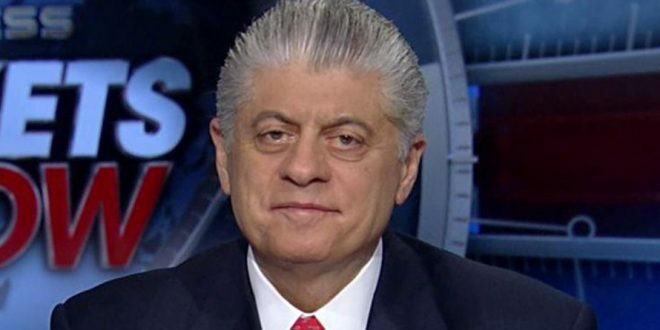 Fox News’ Judge Andrew Napolitano said today if the latest New York Times report on President Donald Trump‘s call with former Acting Attorney General Matthew Whitaker is true, it’s evidence of “corrupt intent” and “clearly an attempt to obstruct justice” from the president. To recap: the Times reported that Trump spoke to Whitaker a few months ago about whether US Attorney Geoffrey Berman could oversee the SDNY Michael Cohen investigation despite his recusal. The report notes Whitaker “knew he could not put Mr. Berman in charge” and Trump ultimately “soured” on him in the end.